REMOVES OLD URINE AND NEW URINE STAINS & ODORS! 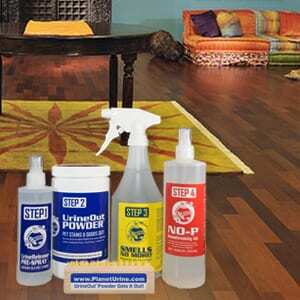 Get those dog urine, cat urine or human urine stains and odors out of hardwood floors, laminated floors, or wood floors. Use our helpful tips and proven products, like UrineOut Powder™ sponges, to get the job done. It only Dilutes and Spreads the Dog Urine, Cat Urine, or Human Urine! Any liquid based cleaning solution doesn’t work because you will never be able to “blot” or wash all of that wet liquid mess out of the pores of your hardwood or wood floors! You still have the urine stains and smell because they are deep down in the pores of the wood surface! Liquid products cannot absorb and extract the urine stains and smell and only masks the urine odors for a short time. Eventually the urine stains and odors return! Cleans up to 125 sq. ft. Hard Surface Cleaning for Dog Urine, Cat Urine, Human Urine STAINS and ODORS. Using the UrineOut Powder™ this is designed for the removal of BOTH urine stains &/or urine odors from hard surfaces such as Hardwood Floors, Tile, Grout, Concrete, Etc. Cleans up to 500 sq. ft. “Godzilla” Sized for cleaning LARGE AREAS of Hard Surfaces for Dog Urine, Cat Urine, Human Urine STAINS and ODORS. Using the UrineOut Powder™ this is designed for the removal of BOTH urine stains &/or urine odors from hard surfaces such as Hardwood Floors, Tile, Grout, Concrete, Etc. Planet Urine’s Odor Detector Blacklight helps you locate INVISIBLE sources of urine odors in carpets, hardwood floors, tile, upholstery and other surfaces when no urine stains are visible. I just wanted to say that I was very skeptical when I ordered this kit. I’ve tried everything to remove the dog urine damage and odor on my hardwood, unfinished floors. Your product worked like a miracle! It did exactly what you said it would do. It was very easy to apply, and my dogs have not been anywhere near the place since I’ve cleaned it. I am so happy with the hardwood floors that I will be buying the carpet cleaning product as well. Thank you so much. You saved me a TON of money – I thought for sure that I would have to replace the floors, which would have cost a small fortune. Where have you been all my life !!?? After using several products “Claiming” to get dog urine stains out of hardwood floors along with the smell associated with said stains, I FINALLY found a product that works as stated! My old dog Roz recently began having seizures and loosing control of his bladder. I thought my beautiful hardwood floors were ruined. This product is HEAVEN SENT! IT WORKS GREAT !!! My hardwood floors have been saved! Yea!! !